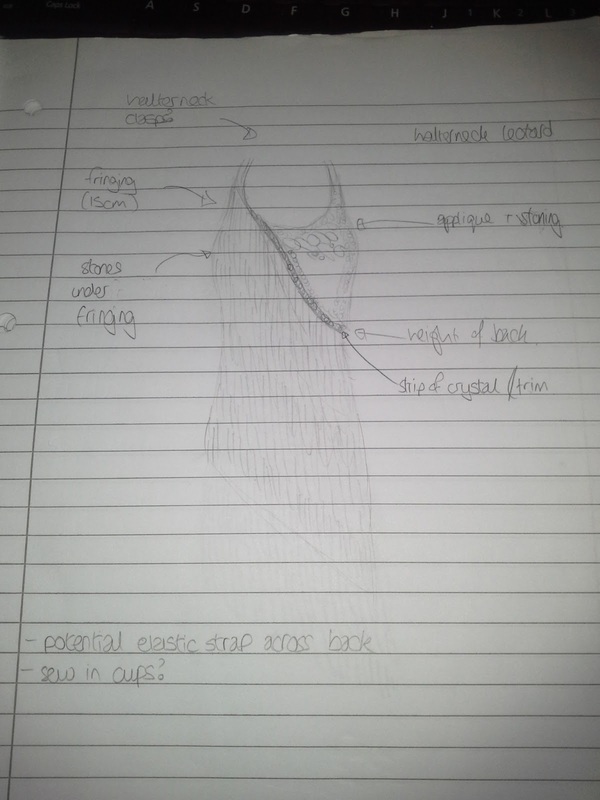 Following on from my previous post Latin Dress: Inspiration I sat down and drew up a design for what I wanted my Latin dress to look like, what materials I might use and any additional features it might have. Since this is my first dancing dress I want it to be fairly simple and straightforward so there aren’t lots of crazy pattern pieces and fiddly stitches. In general there aren’t many patterns out there for dancesport dresses (made with stretchy materials and with lots of embellishment) so it’s going to be a dress without a pattern. I decided to make it a fringe dress, because that should be significantly simpler than having a skirt to sew and attach. It should have a low back, with the line of the fringe following the curve round to the back of the leotard. On the front it will have stone/applique detail on the non fringed section and stoning detail on the fringes and possibly under the fringe as well. If I manage to find a pre-made leotard with the shaping that I want hopefully it will mean that there is only a minimal amount of sewing to do. Well now to go and look and colours and see if I can find all the items I need without breaking the bank… Exciting!